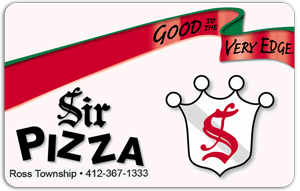 Sir Pizza’s best kept secret and the success of every pizza we make…fresh and delicious. One of the most important ingredients is Sir Pizza’s fresh, smoked provolone cheese for a richer taste and creamier consistency you won’t find in mozzarella. Sir Pizza has a list of toppings to please the taste of everyone, prepared in a style all our own… ingredients are diced and evenly distributed for a more consistent flavor. Why?… Simple! It provides for easier eating and a better division of the pizza. Sir Pizza’s most popular pizza consists of a special blend of our finest ingredients… spicy pepperoni, lean sausage, mushrooms, green and red peppers and onions.